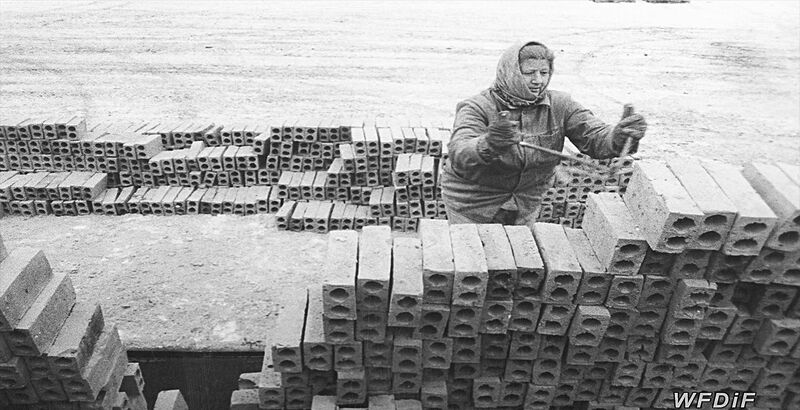 Just one year before the first free election of 1989, Kamieńska once again turns her gaze to the emancipated female, to produce this moving portrayal of women, who under Communism, assumed male jobs. It is as much a story of female strength and persistence as it is of women’s exploitation in the job market. The camera observes two ageing sisters performing their daily tasks as workers on different construction sites in Silesia. In builder’s uniforms, they load and unload bricks. As we learn from one of them, they have done this their whole lives. While the sisters always work as a duo, Kamieńska only records the voice of one to use as commentary. From this narration, the viewer learns about their life experiences and their disappointment with the political regime, where individual effort doesn’t translate to any financial rewards. The woman concludes, ‘I’ve never saved up for anything. I’ve never bought anything. Just the food’. 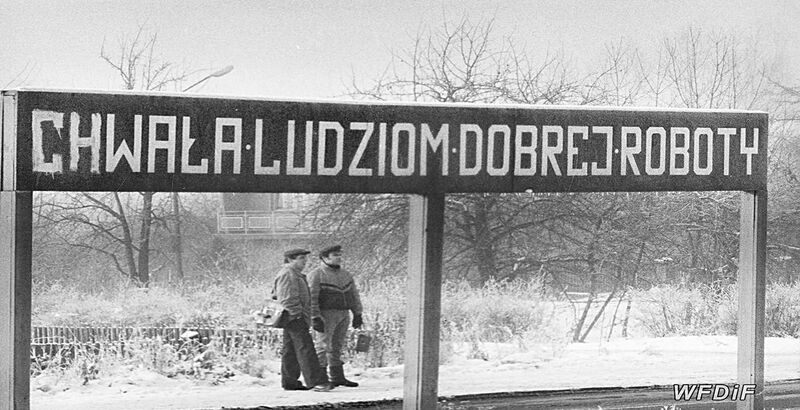 These words are followed by a series of snapshots featuring Communist billboards with slogans such as ‘Praise to the people of a job well done’ or ‘Work towards prosperity: tomorrow starts today’. Somewhat characteristic of Polish documentary films from the late 1980s, this sequence discloses the empty promises of the Communist propaganda about work ethos. For the two women on the screen, dedication to work proved to be a dead end. The promised prosperity turned out to be a lie. The film ends with a shot of the two sisters standing in the snow against an industrial landscape. This silent final frame symbolises the situation of the Polish female. Despite the support she gave to the collective, often feeling snowed under her daily responsibilities, she lived in an eternal winter. Professional opportunities were frozen and adequate material rewards appeared out of reach. Kamieńska’s investment in powerful criticism of the political system may also be read as indicative of her belief that there was still hope for the two sisters, as well as for the whole country. Perhaps, in the end, the sisters stand still in expectation of the spring or a change in the political system, which finally materialised one year after this film was completed. This touching and timely documentary was Kamieńska’s most successful international festival entry. It won trophies in Poland, France, Finland and Germany. Day After Day is available on DVD with English subtitles.